No. On TV all gradients is good noticeable. Just matrix of the camera is overexposure and the black steps is disappear. Hum, I'm not speaking about the black steps but the last light grey/white steps. Also, on your oscilloscope capture, it clearly shows that the last four steps are "wider" than other steps. On the emulator, all steps have the same "width". Strange. Eke wrote: Now, if you can sample MCLK, maybe you can do some of the video signal measures with a game using H32 mode and horizontal interrupt. Or use EDCLK as a reference (pixel clock is only output through some undocumented VDP register bits). What game use H32 mode? Or give me demo, wich do that. - colors 0,1,2,3 in normal mode are the same as colors 0,2,4,6 in shadow mode. - colors 4,5,6,7 in normal mode are the same as colors 1,3,5,7 in highlight mode. - color 7 in shadow mode is the same as color 0 in highlight mode. The weirdest thing is still color levels are not linear but rather "compressed" in the middle. Very surprising. Nice, nice Thank you very much. In case anyone is interested. So, looks like Gen/GS has S/H/N mode wrong then. This also leads to me to stick with my original speculation; that the VDP doesn't have an internal 12bit DAC (with only S/H effecting the inbetween bits) - but rather it looks like the normal 8 steps are effected afterwards in analog. Also, what are the steps in voltage in those charts? And in reference, how does the brightest white compare to say other RGB outputs (like vga, or amiga, etc)? I would like to get a reference as to how close 0xEEE is relative to 24bit 0xFFFFFF. tomaitheous wrote: Also, what are the steps in voltage in those charts? And in reference, how does the brightest white compare to say other RGB outputs (like vga, or amiga, etc)? I would like to get a reference as to how close 0xEEE is relative to 24bit 0xFFFFFF. You have Ultrascope. When you open waveform, you can turn on cursors. They will show you voltage. Then, you must make measurements and get delta from black level. 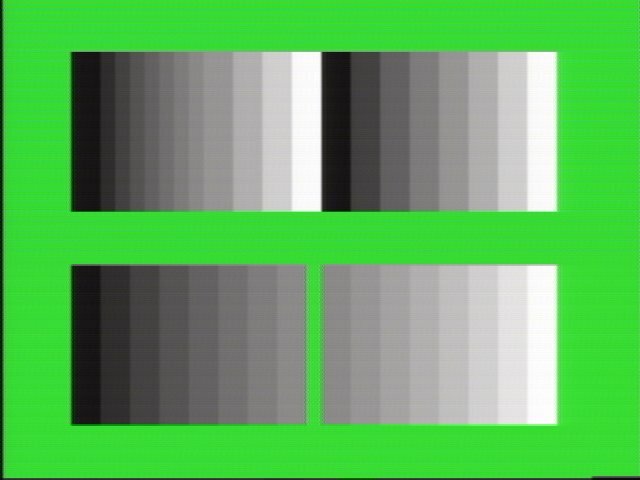 If we assume black level as 0% and white level as 100%, you can calculate percentage of every color level and lay it on byte of computer's truecolor depth. Understand? ok, I figured out, the color codes used in the test program (upper left window) have the same intensity in highlight and normal mode, that's why you don't see differences on real hardware. The reason is that emulators (Kega as well but it got colors better than Gens) are wrong about colors in highlight mode. They probably add 8 to the 3-bits value like genesis plus did, the result is that colors go out of range (8-15 in the below table) and does not match normal colors as they should, which, as showed by the signal outputs, is wrong (highlight min & max values are resp. equal to shadow & normal max values). Another interesting thing is that Charles mentionned in his docs that the overscan area was always displayed at shadow intensity when the STE bits was set, however it does not seem to be the case here (top and bottom borders are shown at normal intensity). Maybe it's something particular to PAL ? I'll upload photos as soon as fileden cooperates. It seems quite symetrical steps to me, considering signal noise.. I'm also wondering, could we assume that pure white would be at +5V (considering AGC and AVC are some kind of reference signals) ? Eke: thanks, that's what I was looking for. So max white is 4.7v. If we did assume max white for RGB was 5v, then that would put max white as ~239 if scaled to 24bit values. That seems to fit the steps by 34 setup for scaling. The thing is that on the signal recording (directly from VDP output, right ? ), there isn't any noticeable differences in the voltage level. There is indeed some voltage drop or jump which result in a tiny separation between bars (some time darker, some time lighter) that gives the impression color changes but they are the same. The tiny voltage variation is probably due to the VDP internally switching between highlight & normal. You can take full record here (use UltraScope for viewing). Now, it's look like EDCLK more complex, than we think. So, what do you think? It seems that HSYNC signal is what triggers the changes in EDCLK frequency, with some latency though. The total is still 840 EDCLKS (420 pixels) with 780 @MCLK/4 and 60@MCLK/5 (total is 3420 MCLCKS). the dots are VDP CRAM writes there, each pixel being in color the color getting into written CRAM... in that case, things are transferred via DMA, each dot represents one "access slot". I made record of control bus signals of VRAM (SE0, SC, RAS1, CAS1, WE0, OE1) in last scanline interval of gradient ladder of TmEE SHLTEST. But, Ultrascope allows show only 2 signals, and we need to show 7. Maybe, I can load it as RAW sound data in multitrack sound editor? Any thoughs?